I am somewhat of a bibliophile (one who loves books). And more particularly, I love to learn about and study the book of all books – the Bible. I guess that would be a more accurate use of the term “Biblio”-phile. 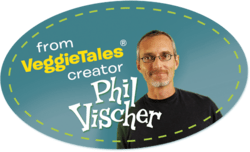 So it is with excitement and anticipation that I share with you a new curriculum from Phil Vischer, the creator of the well known Veggie Tales series (in fact, Phil is the famous scrappy voice of Bob the Tomato). This new curriculum, designed for use in Sunday School or other weekly church gatherings with elementary-aged kids, is called Buck Denver Asks…What’s in the Bible? I took a look at the info and some samples of the curriculum and I am impressed overall. I would certainly recommend it (and if you keep reading, you will see some special discounts on the curriculum that I can offer my readers). Here are the things I like about What’s in the Bible?…. A scope and sequence guided by the overarching narrative of the Bible, rather than topics. I know a lot of curriculum out there follows a general chronological order of the Bible, but this one aims to cover the entire Bible while constantly keeping in mind the overall cohesion and interconnectedness of the Bible. And it uses the entire story of the Bible as the driving force of content rather than just teaching topics illustrated by a few popular Bible stories. Use of a variety of learning methods. This curriculum is self-described as being “media-driven,” but that doesn’t mean “media-only.” There are plenty of interactive activities in small groups. 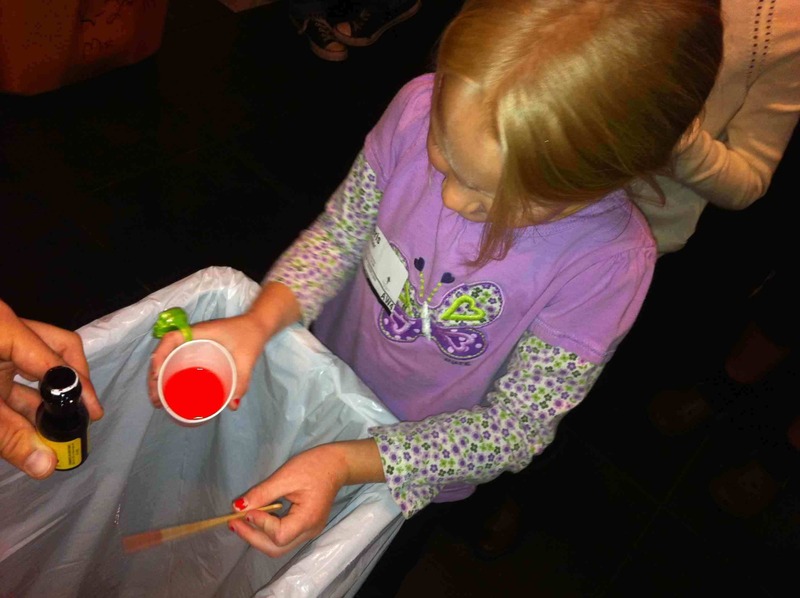 There are hands-on activities as well as more cognitive activities (such as review through trivia questions). I like curriculum that keeps moving and draws on a variety of teaching methods and learning styles. I like how the videos use both puppets and Phil teaching (as himself). The puppets help the kids stay engaged (while teaching about the Bible) and Phil’s teaching brings a very real and pastoral aspect to the content. He is both deep and understandable at the same time. I like the combination of all those elements. The commitment to Scripture. This might sound obvious, but it is important that a curriculum have a strong Biblical grounding in terms of how the writers view Scripture. Phil Vischer has a strong commitment to Scriptural inspiration, authority, reliability, and relevance. To him, the Bible is not just the world’s best selling book that teaches us about the religion of Christianity and how people wrote about it centuries ago. For Phil, the Bible is God’s inspired Word – a revelation from God to us as His message of love and story of redemption. And that changes everything. It’s all right there. You basically have a curriculum in a box. From what I reviewed, it did not appear that the teachers (who are usually volunteers) need to bring much of anything with them except the videos and other handouts/materials provided by the curriculum itself. Any way to cut down on unnecessary clutter is helpful. There is a puppet named Michael who rides in the back of a car on the way to grandma’s house. I’ve seen him before in other Buck Denver videos. Maybe it is my personal preference, but his voice is hard for me to understand. It is very high-pitched and sounds extremely unnatural for whoever is providing the voice for him. I think it is important to have clear and legible communication if you want to convey such quality content. Some of the puppets have no eyes (or, at least you can’t see the eyes due to over-furrowed brows or hats). I think the eyes bring life to a puppet (or any other creature for that matter). Again, it might be my personal preference, but I feel like I receive communication better when I can see some eyes in the puppet, person, or creature. Would you like a pastor to preach a sermon to you with a hat down over their eyes the whole time? There is an extra DVD for a Christmas series (yay!). 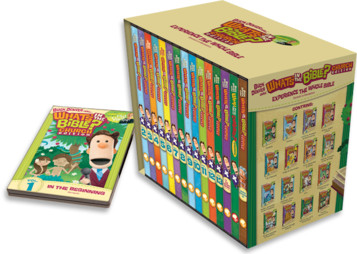 But it would also be nice to have a special DVD series for Lent (the weeks leading up to Easter). They cover the Gospel stories and the death and resurrection of Christ, but I think it would be nice to have a dedicated series that follows the weeks of Lent. There is not much to criticize here, because Phil and his team have worked very hard to put out a great product that will help lots of churches communicate the truth of the Bible in a largely Biblically illiterate culture (and becoming more and more so, unfortunately). Many of us are familiar with the success of Veggie Tales and the way it has become “salt and light” by teaching Biblical truths in ways that are not preachy and are palatable to the masses – both Christian and secular. My hope is that this “What’s in the Bible” project will similarly penetrate into our culture and society in a way that can instruct young people about the most popular (and I believe) most important book in history. I recently spoke at a Family Camp at Camp Dixie in North Carolina. The idea is simple: create a camp experience that involves the whole family. Most camps offer programs for age-specific groups, particularly children’s and youth camps. But Family Camp is where all the members of the family come to camp together and enjoy the experience as a family. This creates memories that last forever and help families bond in ways that are hard to do in the midst of “everyday life” back at home. Here are some things Camp Dixie did well: they had plenty of free play time (for the pool, the lake, canoeing, hiking, go carts, etc.). They also had joint worship services for the whole family (music and a special speaker that is geared towards all ages). And there were some times for age-specific break-out times where the adults went to workshops on different topics and the kids went to do crafts. I enjoyed it and I look forward to returning next year. Here is a video recap of this camp…. Family Camp Weekend 2014 from Camp Dixie on Vimeo. Photo: Forest N. Morrell 2014. 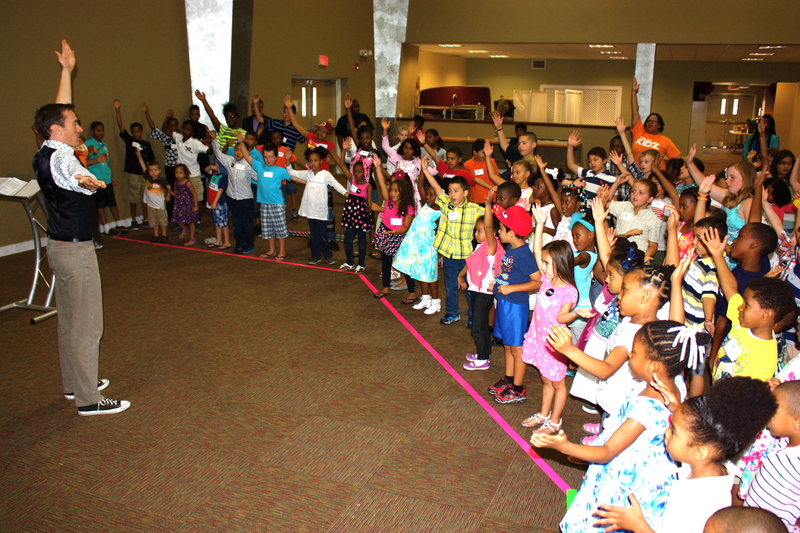 Making an “L” with our hands for the word “Lord” in Ephesians 6:10-11. I personally learn how to memorize things better when I associate the thing I want to memorize with something else that is unique and/or familiar to me. For example, if someone tells me their name is John (a very common name), I might quickly imagine that person dressed up as John the Baptist baptizing Jesus in the Jordan River. Every time I see John, I’ll see that unique and familiar image in my head – and ideally remember his name. Pick a verse that is relevant to the teaching and/or theme you are covering. Try not to pick a very long verse (usually 30-40 words maximum). There is a time and place for memorizing longer passages and that can be done in smaller groups or in one-on-one training. Right now, I am talking about large groups of kids at camp or at church on a Sunday morning or other weekly meeting time. Show the verse on the big screen or have the kids look up the verse together. Make sure you pick a good Bible translation that has a smooth reading of the verse (I usually like the NIV ’84 and the ESV, sometimes the NLT). Have the kids stand up. Attach a motion to each word and/or phrase. I will make up motions (some silly, others just straightforward) to go along with each word or phrase in the verse. I then teach the motions and words to the kids and have them repeat it after me several times. Sometimes I will use a motion from American Sign Language while other motions I simply make up for the purpose of the verse at hand. Once the kids know the words and motions, the trick is just repetition from this point on. You may want to have a “Memory Verse of the Month” (as my friends at The Village Church in Flower Mound, TX have) and review the verse before and after the teaching each week for a month. When I’m at a week-long summer camp, I will call it the “Memory Verse of the Week” or “MVOTW” (pronounced ma-vah-twa). The kids love saying silly words that are really an acronym. When I do the MVOTW, I will open up every teaching session with the kids standing and reciting the verse. They don’t even need the verse on the screen after the first teaching session. Every time after that, they have it all memorized because they have the motions along with it. As a word of encouragement, this is something that anyone can do. You don’t have to be a juggler or a magician. You can make up some silly motions for the verse and teach away. If you have fun with it, the kids will have fun with it. And they will remember (and so will you). I had a group of girls approach me at summer camp a few months ago and they recited the memory verse I had taught them three or four summers ago! They did the verse along with all the motions I had taught them. That is the power of memorizing something along with motions. It drastically increases the retention rate. And retention is what we want when we memorize Scripture. When we or these kids are faced with challenges in life or a temptation to sin, what better thing than to recall God’s Word from our minds (that we memorized) in order to resist temptation or pray through a challenge in life? Even when times are good, Scripture is something we want to meditate on all the time. When Jesus was tempted by Satan in the wilderness (Matthew 4), he was tempted three times and all three times he responded to Satan with a memorized Scripture verse (“it is written…”). 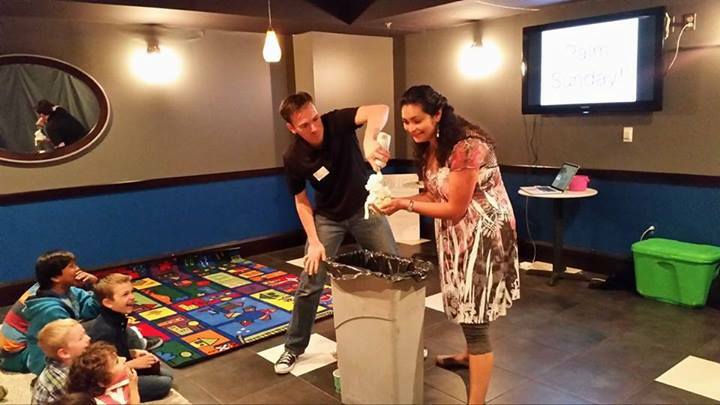 Let’s teach kids how to memorize scripture! I recently returned from Pine Creek Camp in Gore, VA. I was the camp pastor for two weeks with several hundred preteen kids and their chaperones from Assembly of God churches around Virginia, Maryland, Pennsylvania, D.C., and West Virginia. So in the evenings, I taught for about 10 minutes, just reviewing the points we learned about in the morning. Then, for the remainder of the service (another 45 minutes to an hour), we spent responding to God’s Word through the format of worship stations. The camp told me this ahead of time. So I wrote up some station ideas that went along with my lessons each day. The leadership at the camp then took all my ideas and turned them into reality by getting the supplies, setting up the stations, and manning them each night. Question Cards – If the kids had a question about God or the Bible, they wrote them down on a 3×5 card and handed it to an adult. The adult would then attempt to find the answer in the Bible and answer the question. If they couldn’t find it, then they would say “I don’t know” or “I’ll look it up later and get back it you.” This was a surprisingly popular station for the kids. Let me know if you have done worship response stations and what they looked like. Thanks for reading! All photos are credited to Kelly Gibbs. Thanks Kelly! The sixth virtue in Paul’s Philippians 4:8 list is “whatever is admirable.” When we say that we “admire” something, we are speaking of it as something we aspire to, something we want to be like, and something that is worthy of respect and honor. When we fill our minds with things that are admirable, our thoughts help point us in the right direction of growth towards the Lord. Like the other virtues, God epitomizes everything that is admirable. Admiration also represents the things we ponder and think about all the time (that’s what we do with admirable things – we think about them A LOT). What is admirable? Virtuous and wise people are admirable. Godly men and women are admirable. Humility, love, compassion, patience – these are all admirable things. So let’s fill our minds with them.